Mitt Romney – Not Eligible and Dodged Vietnam War | Stop Obama Now!! Mitt Romney protested against Vietnam War protests, but spent much of the years 1965-1975 waiting out the Vietnam War on student deferments or on Mormon missionary deferments, while living in a Chateau in France. In this way he avoided any possibility of being drafted and serving in the War, though he supported others going to war in his stead. 2.5 of those years were spent in France on an extended Mormon missionary tour. With Mitt, his church has always come before country, donating $10’s of millions to the Mormon Church. He also has a foreign-born daddy, like Obama, and Romney has not documented his eligibility, either, as a natural born citizen. It appears that George Romney, his father, did not bother to do the paperwork to establish his American citizenship before Mitt was born. It has never been produced. Mitt will not run an aggressive campaign against Obama. He is more likely to endorse Obama, the same way that McCain endorsed Obama at one of the debates, during the 2008 presidential campaign. In 2008, the voters were also presented with the choice of an Alinsky-style, anti-American Radical or a RINO and Romney is also a RINO! Mitt Romney’s family fled the United States before 1890’s, because Gaskill Romney, the family patriarch, who had 4-5 wives, was was in imminent danger of being criminally prosecuted for polygamy and imprisoned. Hundreds of other Mormon polygamists, who stayed in the US, went to prison at that time. The family did not move to Mexico to serve a Mormon mission as some insinuate or to enjoy a short Mexican vacation. They settled there, because some of the family were fugitives from US justice. They went to settle permanently in Mexico and did not intend to return. Some of Mitt Romney’s family only moved back to the U.S. in 1912 after a couple of decades, due to the onset of the Mexican Revolution, which created another dangerous situation for the Mormon polygamists, who had re-settled in northern Mexico more than two decades earlier. Mitt’s father was born in Mexico in 1905 with Mexican citizenship from birth, after the family had been resettled there for many years. 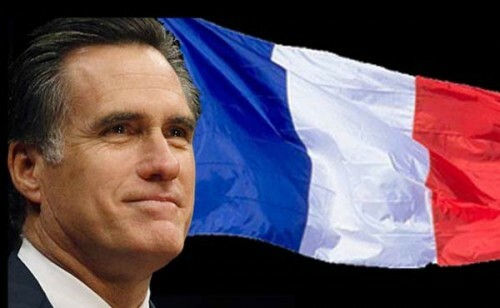 Mitt has never produced documentation that his father had become an American citizen by the time Mitt was born. George Romney was a Senator and apparently he and Mitt enjoy the same impunity with regard to citizenship issues as Barack Obama does. The high and mighty cannot be bothered with questions about their citizenship and constitutional eligibility. The natural-born-citizen clause of the constitution requires that the parents of the candidate be American citizens at the time of his birth. See the link below for details about the constitutional requirement that candidates for the presidency be a “natural born citizen.” A child, who is a natural born citizen is an American citizen at birth and only an American citizen, not a dual citizen. The Framers wanted to make sure the Commander-in-Chief has no allegiance by birth to any other country and that is more important today than ever. If the courts will not uphold the constitutional eligibility requirements, at least in this case the People can help enforce them. Do not vote for anyone, who refuses to prove that he is a natural born citizen, according to the original intent of the Framers. Find out what that intent was, which is little understood by the public. Both parents have to be American citizens and the child should not have rights to citizenship of any other nation. It just seems that the globalist powers much desire a presidential candidate who has a family history of conflict with America, a sense of victimization and a self-worshiping, non-Christian religion, like Obama and Romney both have. In case things go terribly wrong with Obama during this election campaign, Romney is the globalist “Plan B.” The global elites get two choices for president, while the People have none. Diabolical plot to destroy the REPUBLIC and turn it into a Democracy of mob rule?.. Why doesn’t America have an American candidate for the American Presidency? Seems that only Gingrich and Paul legally qualify re/the natural-born citizenship clause Article II Section l requirement of the U.S.Constitution. He hid in France to avoid the war after protesting in favor of it. He supported the war, just wanted others to fight it and die in his place.